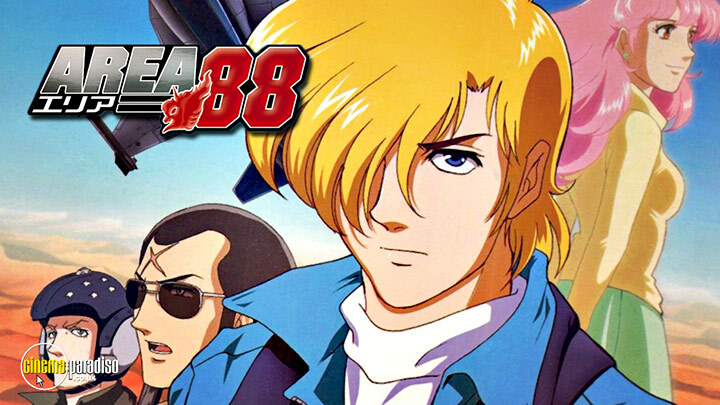 Area 88 is an animated Japanese action/drama TV series featuring the voice talents of John Gremillion, Chris Patton, John Swasey, Serena Varghese, and others. The show is set in Arslan – a fictitious kingdom where the top flying talent is gathered and is expected of them to fight. Usually, these fights do not go as planned. Shin Kazama is a gifted pilot with a bright future, a beautiful fiancee and a job with a prestigious airline until a treacherous act of betrayal rips his world apart and sends him into the barren desert of the war-torn Kingdom of Asian. With escape only meaning death, he must now use his superior skills to become a cold-blooded aerial killer; and with every kill, he paints a trail of blood in the sky back to the life that was stolen form him. Area 88 pushes the boundaries of animation to the limits with a visual beauty that is rarely accomplished. You can almost feel the jet wash on the desert wind. Contains Episodes 1-3. In every life there comes a moment when skills is pushed to the limit, when the only thing that stands in the path of death is the strength of the spirit and the sheer will to survive. Outnumbered and overpowered, Shin is forced to ditch his plane and parachute into the barren, unforgiving desert where he is haunted by memories of his past as he struggles to survive. Back at base a new pilot is turning heads, and she...yes, she...has the skill of an ace and the beauty to match. But Shin is oblivious to her obvious advances as he impatiently waits for his new plane to arrive. Amid thoughts of the life, and love, he left behide, Shin is confronted with the face of the friend who took it all away, and in the last place he would except it: in the cockpit of the 747 barrelling toward him through the clouds. Truly innovative animation and heart-pounding suspense transport you to a world where every breath could be your last. Contains Episodes 4-6. All supply transports to Area 88 have been cut off by the enemy. With the base running low in fuel and ammunition, supply costs have soared. The task of freeing the base from the enemy's stranglehold falls to Shin Kazama and a couple of unlikely pilots. Then, as if that weren't enough, a sniper holds the base hostage with his rifle. The pilots are willing, but they have to locate the sniper first, so Makoto Shinjou decided's to help out with his photographic skills. The thanks he gets is the ride of his life in a cavorting fighter jet on a dangerous roller-coaster enemy base lies at the opening to the canyon, but who will make it and who will fall? Contains Episodes 7-9. The celebration of successfully completed missions has been cut short. The enemy is splashing Area 88's pilots at an alarming rate. Something about the enemy pilot's maneuvers strikes a memory in Mickey, and it's up to him and the rest of Area 88 mercenaries to clear the threat for good. Meanwhile Shin's savings from his kills are approaching his contract buyout price, and he is planning on going home to Ryoko in Japan. However, Kanzaki has other plans that place Shin into dangerous skies. Shinjou is beginning to have a change of heart about his mission, but will it be too late? As the story of Area 88 draws to a close, there is a whirlwind of betrayal and broken promises to keep you guessing right up to the surprise ending. Contains Episodes 10-12.